The reports that Special Counsel Robert Mueller has impaneled at least one grand jury, and rumored more than one, to look into whatever he is looking in to is bad news for someone – maybe more than someONE. The grand jury process is one of the least known features of the American justice system – and for those who do understand it, the most potentially dangerous. We are the only nation outside of Liberia that has such an institution. Both in reality and perception, grand juries operate apart from many of the essential rights we have come to believe we have as citizens. Generally, any prosecutor can get an indictment out of a grand jury. In a more colorful explanation, it is said that any a grand jury will indict a ham sandwich if requested by the prosecutor. One regional analysis in 2014 showed that the grand jury indictment rate was 99.99 percent. Indictment is often considered a “mere formality.” There are several reasons for that. Despite the assurance of the United States Constitution to a fair trial and a right of self-defense, the grand jury is exclusively a prosecutor’s weapon. It is not a judicial trial even though jurors are presented with a highly sophisticated case against the person using carefully selected evidence and testimony. There is no opportunity for the target to present the counter case. In fact, the subjects of investigation and their attorneys are not even allowed to be present to hear the prosecution case. Prosecutors a supposed to provide all evidence, even evidence favorable to the target subject. That is more a legal theory than a reality. It is more like getting all one’s information from only one spouse in a divorce case. Then there is perjury. Next to vote fraud, perjury may be the least prosecuted crime in America. In virtually every trial, people lie under oath. Lying to a grand jury, or even in interviews by law enforcement agencies, is strictly enforced, however. Vice presidential aide Scooter Libby was convicted of lying to the FBI about accusations of which he was ultimately exonerated. Unlike actual trials, the press and the public are barred from the proceedings. It is a secret process within a judicial system in which secret trials are an abhorrence. Grand jurors are not allowed to reveal any of the proceedings and the prosecutors will not. Only witnesses are constitutionally allowed to make public their own testimony if they so choose. To the extent witnesses become known or choose to speak, the public may get some hints as to the purpose and the persons involved. 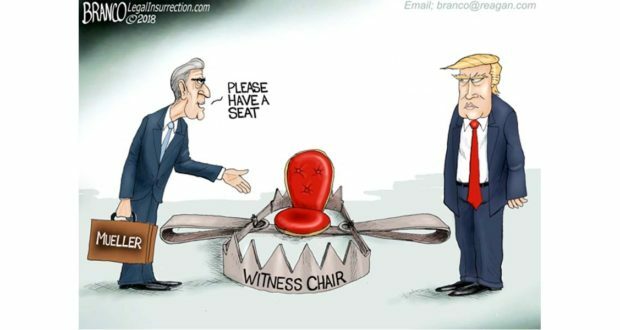 Since the Mueller grand juries will deal with major public figures, it is likely that the public will get a peek into the proceedings. Another reason the indictment level is so high is because of the decision threshold. Many understand that in actual criminal trials, the case must be proven “beyond a reasonable doubt” and civil cases proven on “the preponderance of the evidence.” That is why O.J. Simpson was acquitted of murder in the criminal case and determined to have killed his wife Nicole and Ron Goodman in the civil case where the lower standard applied. A grand jury has even a lower requirement, “probable cause.” A grand jury indictment is not a conviction, but only an opinion that there is sufficient evidence to proceed with a trial. It does not determine that a person committed a crime, but only that they might have. To understand just how low this threshold is, it is the same basis upon which a police officer can enter your house if he has “probable cause” to believe it might reveal a crime. The issues, the politics and the location of the Mueller grand jury also pose a unique problem for any potential targets in the Trump administration. This jury, most likely composed of up to 23 people, is seated in Washington, D.C. and that adds to Trump’s problem. It has been drawn from a pool of people who voted against Trump by a 91 to 4 percent margin and are arguably among the most ardent Trump haters. If it were a real trial, defendants could a request a change of venue and probably get it. But, a grand jury is not a trial. This secret court is not without its critics for obvious reasons. It had been argued that the grand jury process violates the Fourth Amendments “illegal search and seizure” provision. It also tends to make a mockery of the Fifth Amendment protection against “self incrimination.” Although those persons targeted by a grand jury can refuse to comment based on their Fifth Amendment right, and they are then supposedly presumed to be yet innocent, such invocation will most surely lead to an indictment. To become a target of a grand jury is to face the likelihood of indictment. Even if found not guilty on all charges in a subsequent trial, and that is often the case, the person has been dragged through a costly reputation damaging process. Though we profess a belief in “innocent until guilty,” that has no meaning with a grand jury. People can lose careers just due to indictment. It was resulted in divorces and financial ruin. Grand juries produce real punishment regardless of the guilt or innocence of the person. It is almost a certainty that indictments will be issued by this grand jury. The only unknown at this time is against who and for what. How can we the people allow this charade of True Justice to continue! Led by a “dirty cop”! This is just another travesty of the Mueller investigation, if he has something then charge that individual. He has gone power hungry and the country is getting sick of it. Those I know are, even the democrates, are pleased by what Trump has accomplished in his short term and feel this investigation is nothing but a which hunt by sore losers. The real crimes are not being prosecuted, the Clintons and others are being allowed to go on their way regradless to the crimes they have committed. The elite think they are above the law of this country and people are sick of it and their downing of Trump. Don’t beleive me wait till the next elections! Exactly – The last time I was ticketed for going 65 in a 40 zone it was a speed trap. “Unfair”. I told the judge ” I was trapped”. Didn’t help a bit. This tyranny must stop. Congress must stop it before even thinking of taking a break. A couple of responses to this very thoughtful post. You write: “We are the only nation outside of Liberia that has such an institution.” Is the point of that fact to make us suspicious of the Grand Jury System? If yes, then maybe should be even more critical of the electoral college system, which is unique to the U.S. The fact that we stand alone in some ways hardly proves that we’re wrong in doing so. For example, we were the only country to pull out of the Iran Deal. Does that suggest that the pull-out was a mistake? Let us remember that while Grand Juries may often bring about indictments, an indictment is not a conviction. The object of a Grand Jury inquiry retains all Constitutional protections to a fair trial. Yes, there are flaws in the Grand Jury system. Fixes have recently been proposed and I hope we get reform. But for the moment we do not need to worry about the targets of Grand Juries related to the Mueller investigation. If they are indicted, they will have their days in court. If they are innocent, the odds are strong that they will prevail. Finally, I do not see the connection between the thoughtful criticisms you level at the Grand Jury and the issue of “perjury trap.” The only way someone commits perjury is to tell a lie. If a person giving testimony isn’t sure what the facts are, it is permissible–and sensible–to answer, “I don’t know.” I’ve used that response when being deposed. It’s a lot better to admit ignorance than to tell a lie. Very well said! I’ve prosecuted for over 39 years and the grand jury is an excellent tool to be used to weed out poor cases, srenghten the cases that need some additional work, and educate those who serve on the grand jury as to what goes on in their community. Obviously, there are some abuses of the grand jury system, but, by in large, it works well—-to benefit the pubic AND the accused. Grand jury abuses just come back to haunt the poor fool that mis-uses the process. President Trump’s personal attorney Rudy Giuliani slammed as an idiot a New York Times reporter during an interview Sunday on Fox News’ Media Buzz, saying it should be apparent that even honest clients run a major risk of falling into a so-called perjury trap if they agree to meet with federal investigators. Both episodes have been cited as high-profile examples of so-called perjury traps, in which prosecutors secure convictions for lying or telling half-truths without being able to prove any underlying offense.